Isn't It Wild! This miniature quilt features an unusual nine patch design in the center that uses five of the solid colors found in the border print. 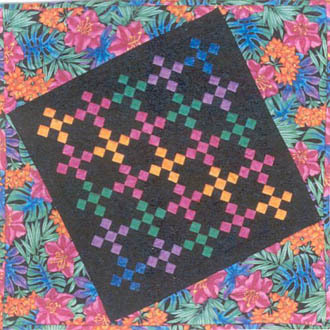 Measuring 16" square, this easily pieced design only requires that you match your colors for a delightfully bold quilt. So grab that colorful print you've been wanting to showcase - it's time to get wild! Price includes shipping and handling.